Welcome to Part One of Our Year in Games here at Reticule Towers. For the next four Sundays, we will be sharing memories and thoughts on what has transpired in our past gaming year. We aren’t limiting ourselves to talking about games released this year, anything goes. Have no fear though, we will be taking a look at Our Games of the Year at Christmas, though I doubt we will come away with a definitive verdict. 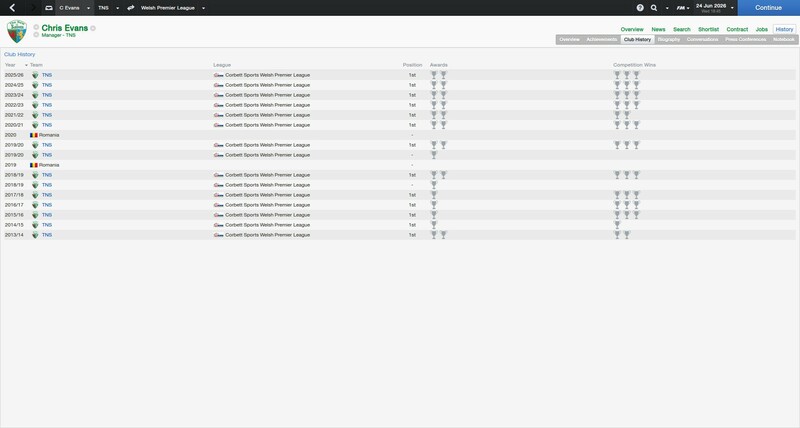 Some of my personal stats in my time in charge of The New Saints. First things up and I’m going to talk about Football Manager 2014. It might be a game that was released October last year, but it is something which I continued to play deep into this summer. Steam says I have played over 220 hours of this game, with the vast majority of that time taking place with my TNS save. I look at the game now, and my plucky New Saints are waiting for me in June 2026 to try and relive the glory of the 2025/26 season where I came runner up to Inter Milan in the Champions League. 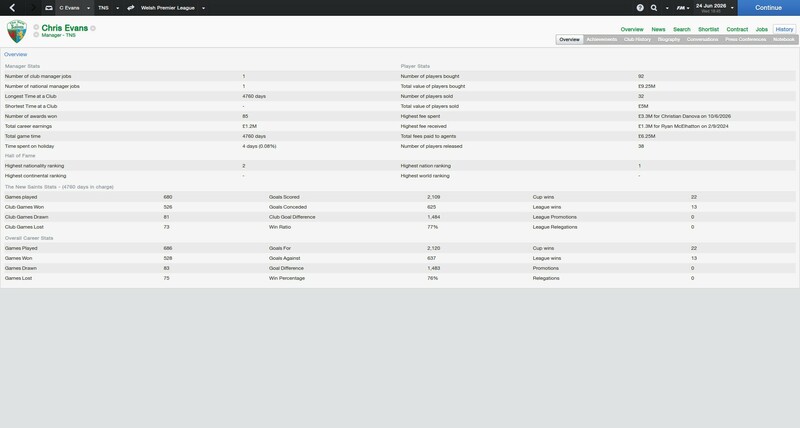 There have been so many stories I have shared from this game over the past twelve months of Our Week in Games, but it really strikes me as the definitive Football Manager of recent years. I know there are die-hard fans who get into the nitty gritty aspects of the game who will say that the new edition is by far the better game, but for me, 2014 far outweighs 2015, and that is despite the much improved new user interface that was introduced this year. Impressive domestic form, but I still lack the ultimate prize of the Champions League. You know, there’s only really been one new game that’s come out this year that’s stuck with me. I’ve tried for the life of me to recal all I’ve played, and see what stuck, but there’s just one title that I remember fondly from this years releases. It’s not even, technically a new title, but.. Well, you’ll have to wait until our games-of-the-year for the name…. Terrible of me I know…! If you know me at all though, you’ll know that I’ve been spending an inordinate amount of time playing XCOM; it’s my go-to game. It’s the one I fire up when all else fails and it’s still a title that excites me, scares me (when I’m about to lose a prominent squaddie) and infuriates me (when said squaddie invariably dies). I’ve spent worryingly large amounts of time on this game and I still think the multiplayer is one of the best out there (though it is increasingly difficult to find a good match). I’m currently in a play-through which is seeing me put off the early ‘obvious’ and mission critical research in an attempt to give myself a leg-up on the early game. I’m attempting to get the third armour tier and ideally to laser-weaponry before I start seeing Mutons. I’ve also added the slingshot DLC to spice things up a bit. Ironically, especially given that I’ve finished it on classic ironman a number of times, I’ve never finished the first Exalt mission. You know the one where the French convoy is attacked. For some reason, I always get the Exalt guy killed. The mission itself shouldn’t be difficult- you only see Sectoids and Thin Men, but the way the level is set up presents some real issues. There’s two buildings in what is effectively a corridor. There’s plenty of cover, but then the enemy tend to spawn in awkward locations. Initially they spawn on the ground floor of the second building. This provides an interesting challenge even if you did take the high ground early on. Luckily though, due to my…. Slower start I already had a mech soldier, a sniper and a high level assault. So the sniper took out one of them on the ground, while the mech took the other. You then get intermittent spawns on both rooftops that continue mostly for the rest of this level. There are also spawns near the downed Exalt goon, and the gap between the two buildings. I left my mech (Nick) to hold the ground between the two buildings (not having rocket boots yet), I left my sniper on the second building, looking back at the first, and then I used my support to cover the assault as she went down to get the Exalt goon. It works. Both spawns on the roof are killed in one turn- Nick taking one, my sniper the other. My assault then had a running battle with two thin men (there’s usually only one) while my support escorted the package to the first building. As the package gets to the first building another spawn wave occurs, and I actually almost lose my sniper: reminder, like one was needed, that even a Thin man can can do serious damage. This time though. Splitting my forces worked. I’ve tried this tactic three times preciously, all were failures, but I think the damage potential of Nick swung the mission for me. It was then a cake-walk to the extraction point. Hulk found rock. Anyone missing rock? After Indiana Jones’ rather mediocre entry into the world of Lego games, I thought I was done with the rather formulaic pattern of block breaking and baddie bashing that make up 98% of the Lego game franchise. It turns out that I was just waiting for the right game. Lego: Marvel Superheroes doesn’t particularly change the usual formula, but what it does bring to the equation is sheer variety of characters. With the immense Marvel catalogue of heroes and villains on offer, it’s almost inevitable that you’ll find at least one character that just seems to fit. For me, it was the Hulk. Who better to play as in a game made up almost exclusively of smashing either objects or people? His animations are hilariously over the top and the way he casually boots attackers into the distance frequently makes me chuckle. On the rare occasion where bashing isn’t productive or socially acceptable, the Hulk’s alter ego Bruce Banner can take the reins; with his smaller stature and technical skills there are few issues at least one of the two can’t cope with. 2014 has, for me at least been the year of the superhero. Whilst Hollywood may be churning out repetitive variations on the hero format, gaming has rarely managed to do the superhero thing right. I never thought it would be Lego that would manage it, but with Lego: Marvel Superheroes they sure as hell came close.